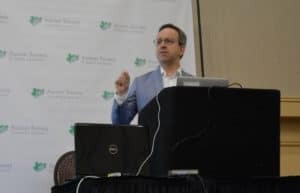 Dr. John Spiro of the Simons Foundation presented on “From Genes to Biology: What We Know and Why It Matters” on Saturday, March 23, at the Autism Society of North Carolina’s annual conference in Charlotte. For those who were not able to attend his presentation, we are sharing some of the highlights here. About 12 years ago, research into Autism Spectrum Disorder began improving, Dr. Spiro said. Studies were conducted on larger cohorts of up to 3,000, and more researchers were sharing their data. More high-quality, standardized data was available, and genetic sequencing saw huge technology advances at the same time the cost was dropping. Now, scientists believe that they have found 70-100 genes that are very likely to be related to Autism Spectrum Disorder. But we are still in very early days, and research is ongoing, he said. The primary goal is to use the list of genes and turn it into something that makes a difference in the lives of individuals with ASD, Dr. Spiro said. To continue making progress, Dr. Spiro said, it is critical to scale research to tens of thousands of people. Researchers need families to be ready to participate in studies, educated, and excited. Everyone should be involved in research, he said. In April 2016, the Simons Foundation launched SPARK, an effort to collect data from at least 50,000 individuals with autism and their families. SPARK, or “Simons Foundation Powering Autism Research for Knowledge,” aims to speed up research and advance the understanding of autism to help improve lives. Dr. Spiro said it was important to have medical and genetic information from “completed trios,” or the individual plus their biological mother and father. As of March, SPARK had enrolled 15,991 trios. It has 69,555 participants with ASD and 177,452 overall participants. Researchers have completed genetic sequencing on more than 30,000 individuals and returned 35 clinically validated genetic findings. UNC is one of more than 20 medical schools and autism research centers to join SPARK to help recruit individuals and families affected by autism. Representatives of UNC SPARK attend many of the Autism Society of North Carolina’s events to connect with families. Enrolling in the study is easy and can be done online. A saliva-collection kit will be sent to your home at no cost to you. Families who want to register can go to www.SPARKforAutism.org/UNC. If we can identify people with autism at a younger age, Dr. Spiro said, we could provide treatment and interventions earlier to take advantage of maximum brain plasticity. Most of our current measures are behavior-based, so they are subjective, episodic, provider-based, and reactive. Genetic research will provide objective, continuous (over lifetime), ubiquitous measures. Dr. John Spiro is the Deputy Scientific Director of the Simons Foundation Autism Research Initiative (SFARI) at the Simons Foundation. He joined the foundation in 2007 and oversees all aspects of SFARI’s research initiatives. Dr. Spiro will update attendees about the importance of recent discoveries in genetics and ongoing SFARI research efforts such as SPARK at UNC.